As a child, Koxinga's was forced to live apart from his Japanese mother, Matsu Tagawa, by his powerful Chinese father, the merchant-pirate Zheng Zhilong. The three were eventually reunited in China. The country was in turmoil. Zheng Zhilong, previously a staunch supporter of the Ming, defected to the Manchus; Matsu Tagawa died a terrible death; Koxinga did not live to enjoy the fruits of his success in defeating the Dutch and driving them out of Formosa. But he won for himself fame, and he bequeathed to his feuding children the chance to rule the newly-liberated island. Bergvelt is as interested in the hapless Dutch colonialists as she is in Koxinga and his family. 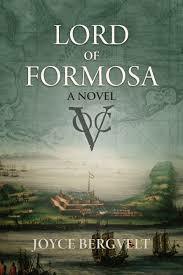 In an author's note she says that even in the Netherlands few people know the Dutch once colonised Formosa. Her novel does not shy away from the cruelties of Dutch colonial rule, but it treats the Dutch as human, rather than simply as big-nosed barbarians. The Lord of Formosa offers a gripping tale, with plenty of food for thought for anybody interested in power struggles between colonialists and the people they ruled, in East Asia and beyond. Read Joyce Bergvelt's guest post for Asian Books Blog here. Details: Lord of Formosa is published in paperback by Camphor Press, priced in local currencies.